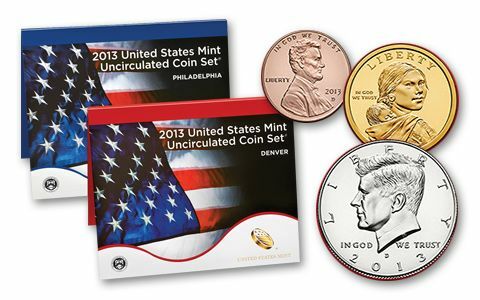 About the sets: The coins in the 2013-PD Mint Sets were Uncirculated pieces pulled from regular production runs, thus the quality of the individual coins varies widely from set to set and even within a set. One example of each of the following from the Philadelphia and Denver Mints: White Mountain National Forest, Perry's Victory and International Peace Memorial, Great Basin National Park, Fort McHenry National Monument, and Mount Rushmore National Memorial (all Copper-Nickel Clad). The four Presidential Dollars are William McKinley, Theodore Roosevelt, William Howard Taft, and Woodrow Wilson (Copper-Nickel Clad). The Native American Dollars honor the Treaty with the Delawares (Copper-Nickel Clad). About the sets: The 2013-PD Mint Set contains five new issues in the America the Beautiful™ Quarter program, one of which depicts the popular national landmark, Mount Rushmore. Original packaging: The 2013-PD Mint Set consisted of two different sets in two blister-style folders. 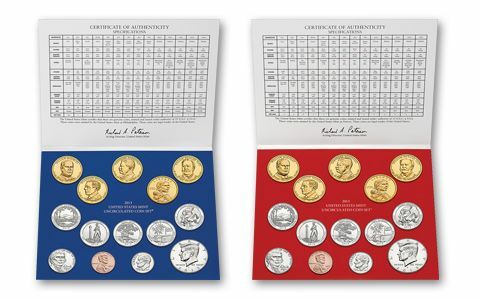 The blue folder contains coins from the Philadelphia Mint, the red folder contains coins from the Denver Mint. Each folder contains the Cents, Nickels, Dime, Half Dollar, and Dollar, alongside the following five 2013 Quarters: White Mountain National Forest, Perry's Victory and International Peace Memorial, Great Basin National Park, Fort McHenry National Monument, and Mount Rushmore National Memorial. Completing each folder are the four 2013 Presidential Dollars: William McKinley, Theodore Roosevelt, William Howard Taft, and Woodrow Wilson. Two Explosions near the finish line of the Boston Marathon leave 3 people dead and 260 injured. A tip leads police to the backyard-stored boat at a home in the Boston suburb of Watertown, where the second suspect is captured. Following tensions between the Senate and the House of Representatives, Congress ultimately reaches a stalemate, resulting in a shutdown of all federal government departments deemed nonessential. The new, increased security $100 Bill is released into circulation. Jorge Bergoglio is elected Pope Francis. The cache of documents released by NSA whistleblower Edward Snowden shed light on the extent of U.S. espionage operations in various parts of the world and threatened to damage U.S. relations with some key international players. Civil War rages in Syria.